Half diamond eternity ring, holding 0.56cts of channel set diamonds across a 3.8mm wide band. 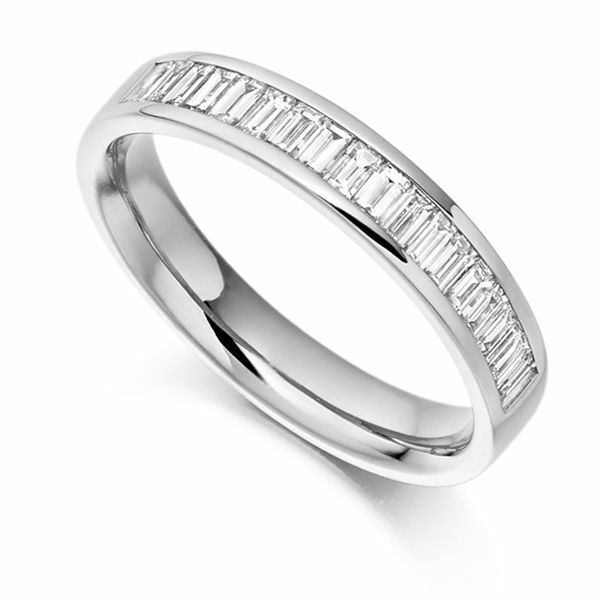 This precision set Baguette cut Diamond Eternity Ring is as eye-catching as it is comfortable. The Baguette cut Diamonds total 0.56 carats and rest gracefully in the half channel setting. The meticulously set Diamonds weigh a total 0.56 carats and have been graded F Colour and VS1 Clarity. The band is 3.8mm in width and is a flat court profile. Available in a choice of 18ct Yellow, White or Rose Gold, 950 Platinum and 950 Palladium finishes. This both timeless and classic Eternity Ring will arrive beautifully packaged, ready for that perfect moment. Please allow 4 weeks for delivery as this design is crafted to order. A beautiful diamond ring that my wife is thrilled with.